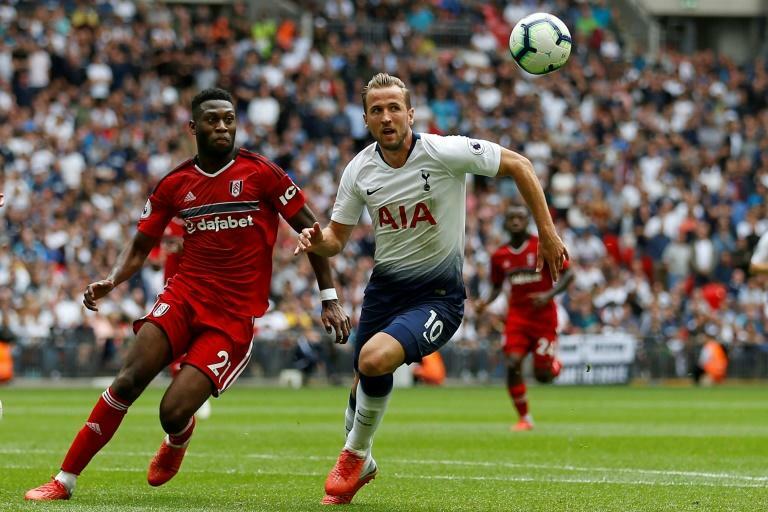 Tottenham striker Harry Kane finally scored a goal in August as Mauricio Pochettino integrated his World Cup stars back into Premier League life with a 3-1 win over Fulham on Saturday. Kane had never scored in August in 14 previous matches until claiming his team's third goal after 77 minutes on an afternoon when the nine Spurs stars who reached the World Cup semi-finals continued to return to domestic action. "I'm very happy for him," said Tottenham manager Pochettino. "It was important for him, important for him to feel the net in this period because, if not, we'll make a trauma for him! "He told me that after the game so he knows it's good." Kane's goal had been set up by a surging run from substitute Erik Lamela and came four minutes after Spurs had regained the lead at Wembley through one of his England team-mates, defender Kieran Trippier. Playing for the first time since his World Cup exploits in Russia, Trippier scored via a magnificent 25-yard free-kick, reminiscent of the one he netted for England in their semi-final defeat by Croatia. "He came back from the World Cup the same. But of course your trust and confidence in yourself increases," Pochettino said. "But the most important thing is for him to keep humble, keep working and, in the end, England didn't win! "Still, with Tottenham, we didn't win (a trophy). In football we're here to try to win, not be fourth, third, second. "I told you, I felt the energy when we all arrived here, when we all started to work together in pre-season. "The mentality has been very good and if you are strong in your mind then you can compete." Along with controversy over Tottenham's failure to have their new stadium opened on schedule, the biggest early-season question for Pochettino had been how he would integrate his World Cup stars into his side after such a short break. The answer, generally, was very well, although the opening goal after 43 minutes was scored by a player not involved in Russia, Brazilian forward Lucas Moura. The 26-year-old had impressed on Tottenham's pre-season tour, having found his first-team chances limited last season after joining the club in a transfer from Paris Saint-Germain in January. He showed he is in the mood to maintain that form with the way he connected with Calum Chambers' weak clearance, from a Christian Eriksen cross, sending a superbly-weighted left-foot shot into the top of the Fulham goal from the edge of the area. Lucas had already missed with a close-range header and a one-on-one with keeper Fabri which ended with him fouling the Fulham man so Kane's follow-up goal was ruled out. But Fulham also threatened, with Hugo Lloris having to save from Tom Cairney and Ryan Sessegnon and, after Aleksandar Mitrovic hit the post early in the second half, he equalised on 52 minutes. Defender Joe Bryan whipped over a dangerous cross which Mitrovic failed to meet, flinging himself to the ground in the process. But Sessegnon had the presence of mind to meet the ball at the far post and turn it back across goal for Mitrovic, still lying on the Wembley turf, to head into an open net. Spurs' response was ruthless with Dele Alli having a shot cleared off the line and Kane volleying against the bar. And after their two quick goals, Spurs might have added even more with Lamela, Kane and Alli all firing straight at the keeper and Lamela shooting over from close in. "We need to be happy, we are happy, but we have only won two games," said Pochettino. "The next game, on Monday at Old Trafford, is a better challenge, to show if we can compete for the big things or not."